Macramé is back and better than ever. This art of knotting cord or string to make unique patterns first gained popularity in the '60s and '70s, and it's enjoying a renaissance right now in home décor and in weddings. Here, check out 35 ways bohemian brides are including the technique in their weddings. A macramé curtain suspended from a simple ceremony structure makes a romantic backdrop. Mirror the look on your ceremony chairs. This intricate design coordinates beautifully with the lace on the bride's gown. A pair of hoop wreaths with a simple macramé pattern creates an easy backdrop. Or opt for one jumbo hoop wreath with a macramé banner. Macramé doesn't have to be elaborate to make an impact. These simple knotted banners add a boho vibe to a basic arch. 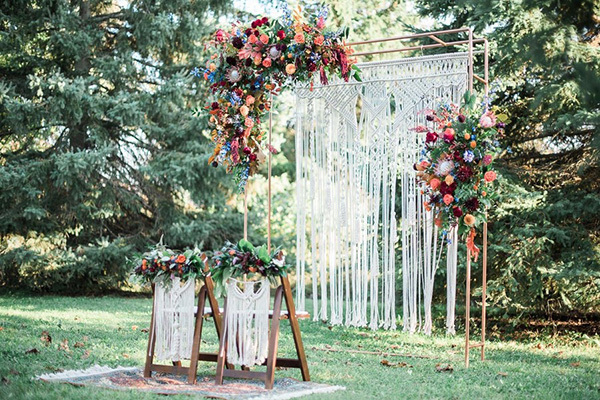 Macramé paired with an elaborate floral arch creates such a romantic look. Dress up your ceremony space with macramé lanterns. Use macramé to transform a simple frame into a gorgeous bohemian arch. Weave a diamond pattern into your macramé arch for an elevated look. Suspend hoop wreaths from metal stands throughout your ceremony space. Mark your aisle with a macramé banner. Wrap your bouquet with the technique to add a little something extra. Perfect for a boho bride, create a fun, carefree-looking garter. Suspend your wedding seating chart from a macramé display. Turn your seating chart into a piece of art with intricate woven lines of string. Add floating florals to your seating chart to create an Insta-worthy moment for guests. Use a clothes pin to adhere the seating chart to the macramé. Utilize macramé to suspend potted floral arrangements overhead. Exposed, hanging tassels add a fun touch to suspended flowers. Use the technique to create boho chandeliers. Use macramé to hang candles over your tables. A macramé table runner is the perfect addition to a boho wedding theme. A table runner not only protects the table from hot plates, but also adds a festive décor element. A boho-feeling table runner looks natural paired with greenery. Wrap your tables in macramé skirts. Set each seat with a mini macramé hanging that doubles as a favor. Wrap your silverware with a macrame ring to give your tables a nice boho touch. Set the bride's and groom's chairs apart from the crowd with macramé hangings and wooden signs. Macramé banners create a fun focal point at your reception. Good vibes only! A dreamcatcher makes a lovely decoration that you can also reuse in your home after the wedding. Dress up your bar with a simple macramé banner adorned with a metallic sign. A macramé banner gives your cake a little touch of boho. A macramé banner interspersed with dreamcatchers creates a lovely, romantic background for your dessert table. Use macramé to suspend your cake from the ceiling. Add a macramé-inspired design to your cake.